This audio lesson will help you master the modern spoken French pronunciation of French object pronouns: le, la, les, lui, leur. Some are glided, some totally disappear when native French people speak fast among themselves. Repeat the audio and you’ll get it! French people very much glide over the French direct and indirect object pronouns, which creates a lot of confusion for foreigners who only learned French with books and don’t know the common spoken French pronunciation. 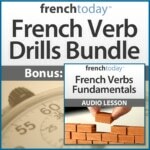 In this audio lesson, we are going to drill with the French object pronouns. Play the audio, drill out loud and repeat as many times as necessary until this becomes natural to you. To learn French object pronouns, what they are and how to use them, please follow this link, or look in a grammar book (such as my audio method + novel À Moi Paris Level 3). In this article, I’ll focus on the pronunciation. This is not an easy lesson to write because glidings are a street thing, and they change a lot – and fast… Just like in English you write “I am going to give”, but say “I’m going to give” or even say “I’m gonna give”, French people will glide over the pronouns in a lighter or a stronger way. The way someone speaks is a matter of personal preference, social class, context, region, age… The same person may apply more slang and glidings when among friends, speaking casually, than when being in a job interview. Age is also a big condition: young people tend to apply more glidings and use more slang when they speak than adults. I suggest to my French students that they learn “the middle” way ; some glidings, but not total street French. “I’m going to”, not “I gonna”. But it’s important that you understand both spoken and traditional French pronunciation, therefore also train with “full glidings” to understand the French when they speak. This is why all of French Today’s French audiobooks are recorded at several speeds (and gliding levels). To train with the French object pronoun glidings, we are going to use the verb “donner” (to give) which can have both a direct and indirect object. We are going to drill in the present tense. First, I will record the statement as it is written. Then, when it’s possible, I’ll apply the middle gliding – the one I suggest you learn – and then the extreme gliding so you get accustom to hearing it. As you’ll notice, most of the glidings happen with “je”and “le”. The “il and ils” become “ee” and “elle and elles” become “è”. “Tu, nous and vous” don’t glide too much (except with “le”). So now, let’s drill on the modern pronunciation of French object pronouns. Je le donne – I give it/him. Je la donne – I give her/it. Je les donne – I give them. Now let’s Concentrate a bit on the “je” Form that Gets Most of the Glidings. You’ll note that the French direct object pronoun totally disappears in the extremely glided version. You’ll note once again that the French direct object pronoun totally disappears in the extremely glided version. To master direct and indirect object pronouns in French, as well as other useful pronouns, I suggest you check out my French learning audio method À Moi Paris level 3 : I explain them clearly and illustrate the grammar with a lively and fun story. Want to master French Verb Conjugations? Check out my French Verb Drills.